Growing up in Oregon, it was pretty absurd that we had a house with a pool in the backyard. On average, it rains 221 days a year in Portland which left the month of August for my siblings and I to enjoy our unheated pool when temperatures coasted around 80°F, possibly 90°F if we were really lucky. Who needs to enjoy the water though, amiright? It’s water! Who cares how cold it is? Who cares about frostbite? Who cares about lightning? Portland is also a mere hour away from the Pacific Ocean and since we were already well acquainted with swimming in sub freezing aquatic waves, only one question mattered: Who was going to jump in first? Must. Always. Jump. Into. Pool. Our pool was shaped like a kidney bean with depths reaching nine feet, and a tile decorative shark on the bottom of the shallow end. We liked to dare each other to touch the nose of the shark with our toes. I remember inching my way around the rim of the pool until I got to the deep end before plunging myself into the water. I would allow my tiny body to sink to the bottom of the pool before using a burst of energy to propel myself to the surface by jumping off the floor of the pool. The six of us never received swimming lessons, we never took water safety classes, and we never wore swimming floaties. Yet, we are all very comfortable in the water and excellent swimmers even though we may not ever be able to compete against Michael Phelps. Water has always been a huge part of my life, and it’s always been a huge part of our children’s lives as well. 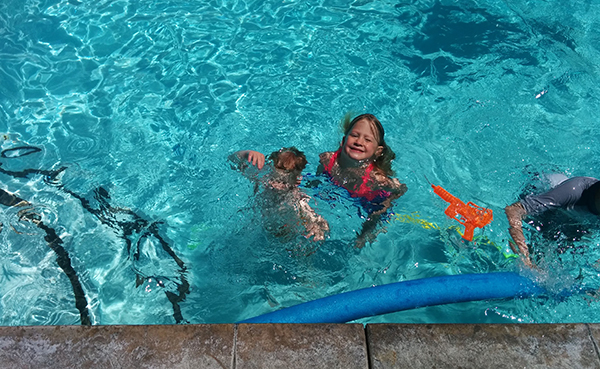 We started teaching the twins how to swim from day one, and naturally continued the trend with Baby Eclair. 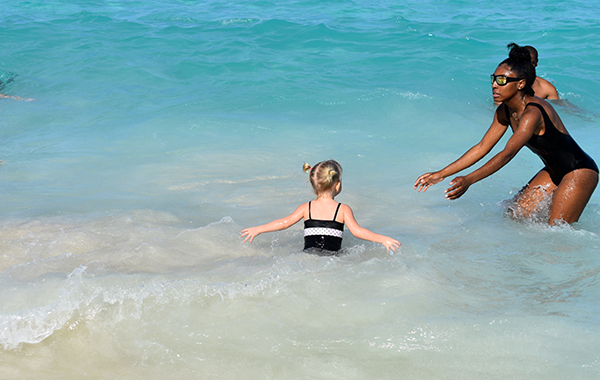 Our children love swimming and we take every opportunity to play in the water every chance we can get. Inevitably, we are always met with interested onlookers who witness our tiny toddlers jumping off the side of the pool with what appears to be reckless abandon. Parent’s rush to their aid only to find them swim to the surface laughing and begging for more. Slack jawed they ask how our babies who can barely talk and barely walk, know how to swim. The answer is they never forgot. Babies are actually born knowing how to swim, how to hold their breath, and how to navigate through the water. Just as with any unused skill, they forget if they do not hone and practice this skill. We simply never let them forget. **For the record and quite important disclaimer: We are not professional swim instructors, nor are we licensed in any way to provide information on teaching young children how to swim. 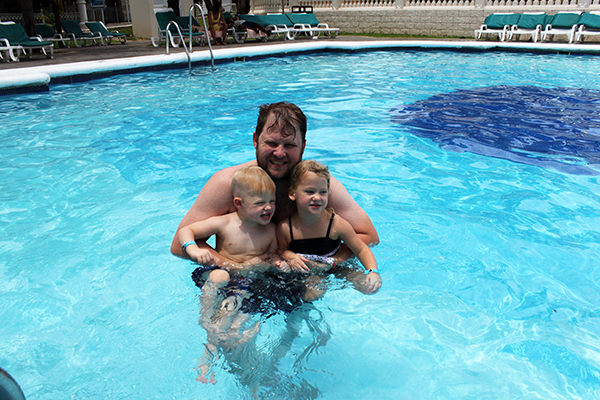 We are simply adults and parents that know how to swim, and this is how we taught our children how to swim. This was always my parents first rule, and we never paid attention to it. Like most children, we made poor decisions. Similar to not knowing when we were too tired to quit swimming. Like not knowing how deep the water is. Like not knowing if there is an undertow in the ocean. My sister and I played our favorite game every time we got in the water. We would swim to the deep end and without using our hands we had to wiggle our swimsuits off and then put them back on again. No touching the edges of the pool either! All our hands could do was wade in the water and help keep us afloat. When we were about six and eight years old respectively, we decided to play this game in the Pacific Ocean on the Oregon coast while our dad was nearby on the sandy beach. Without the barrier of the pool we drifted and drifted and drifted until we were so far out that it was only because our Dad was watching and came out to get us that we made it back to shore. Children cannot make good decisions. Psychologists argue that the brain isn’t fully developed until the age 25 and while I am not making the argument to watch them in the pool until the ripe old age of adulthood, I am stressing that even the most expert swimmers should never be left alone in the water. Children need supervision. Foremost to keep them safe, and secondly to make sure that the parental bond of trust remains intact. In the beginning, you’ll have to get in the water with them. 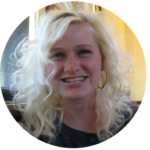 We typically start our children around three months old; once they start holding their head up unassisted. We begin with breath control. We hold the baby in front of us, face to face, and show them how to hold their breath. Once they start mimicking, we explain that we are going to go underwater. We slowly start by submerging just the mouth first, then come back up above the surface and laugh, coo and giggle. After doing that a few times, we’ll submerge until the nose and mouth are underwater. It’s important that the child can see you and that you are doing the same thing with them. Finally, we will submerge the entire head and hold underwater for a second or two. It shouldn’t take more than one session for the child to learn this skill and over time, the child will be able to hold their breath longer and longer. From breath control we learn the skill of maneuvering from front to back. After this is mastered we learn kicking. 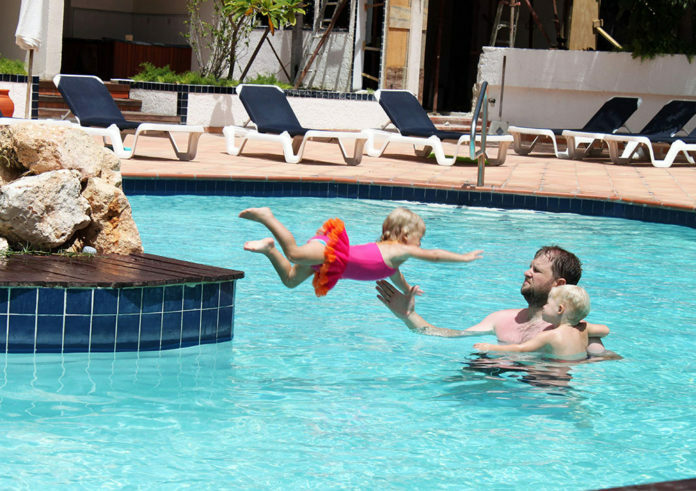 This can be done by holding on to the edge of the pool, by holding onto Mom or Dad’s back, or have Mom or Dad hold the child’s head while they kick with their feet. All children learn at their own speed. 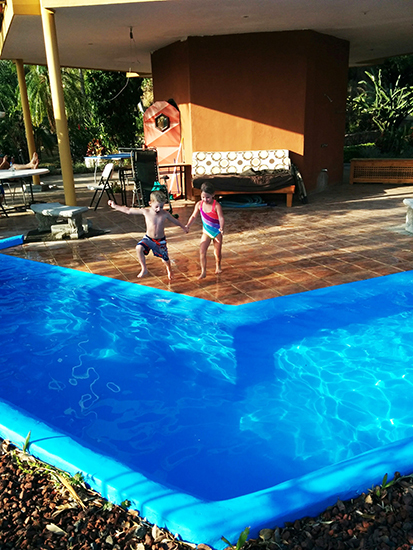 Our twins were four when they could swim the width of a pool without assistance. Eclair was three. Every child learns at his own pace; any parent is witness to this no matter the subject. Swimming is no different. We can attest that the earlier you start and expose them to swimming, the quicker they’ll remember. But, babies actually aren’t strong enough to hold their heads above water so swimming will be somewhat modified. This is why you see videos of infants floating on their backs and propelling themselves to the water’s edge by kicking. Don’t be discouraged if they can kick and float and hold their breath and swim underwater, but they can’t lift their head up to take breaths. Encourage them to roll over in the water and kick while breathing with their mouth exposed. In deep water, they won’t be able to lift their head out of the water until almost they are almost three years old at the earliest. There is still so much they can do in the water. They can swim from one edge to the other. They can play and kick and splash. They can jump into the deep end, kick to the surface, and swim to the edge. Don’t race to your children if they jump in the water, and especially don’t start screaming frantically. They will come up, rest assured, and you can compliment them on being so brave. Nothing can be so disconcerting to a child than to feel confident enough to do something, only to have an adult tell them how terrible they were for doing it. 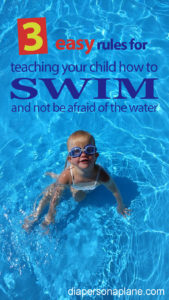 Your hardest obstacle in teaching a baby how to swim will be the other parents. We have found that it makes other parents very uncomfortable seeing babies jumping into the water and swimming under the surface. 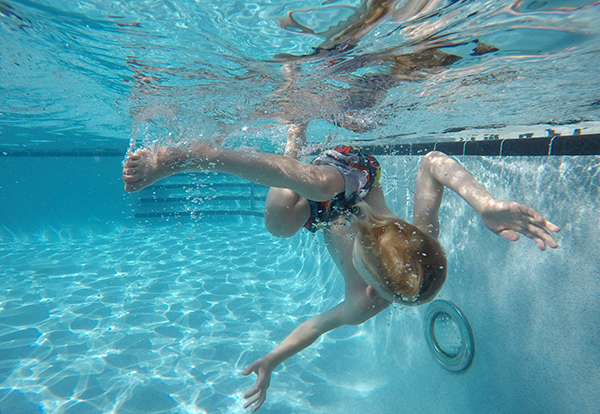 Calmly alert other parents that they know how to swim whether this is when you enter a public pool, and you see them eyeing your child, or they start freaking out and madly racing to them when they jump off the edge even when you are within arm’s reach. 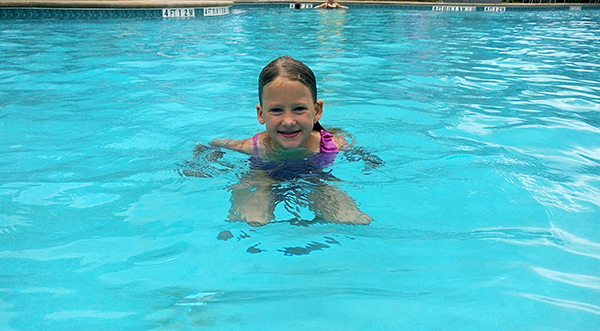 We were actually banned from swimming at a local pool last summer when Eclair was two years old because the lifeguards didn’t feel comfortable with her swimming underwater between Gabriel and myself. They told us if we let go of her in the water, we wouldn’t be allowed to return. There was no chance she was going to let us hold her in the water, even if we wanted to agree to their ridiculous requests. 3. Do Not Use Swim Floaties or Life Vests, Swim Trainers, Puddle Jumpers, Personal Flotation Devices, etc. These devices do nothing more than mimic swimming, they don’t actually teach a child how to swim. 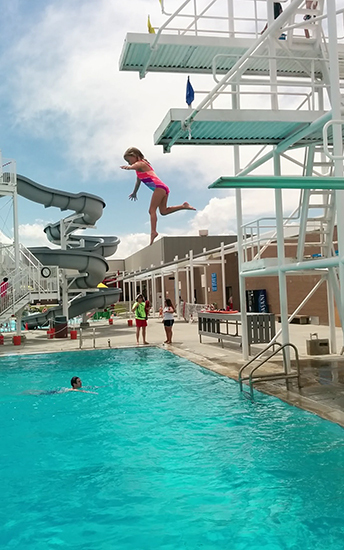 At best, they impair children’s ability to swim; at worst, they fail to teach children water safety. On the other hand, they are very convenient and allow children to remain upright in the water – hands free. The problem I have with flotation devices is that the first rule children should learn about swimming is that water is dangerous. That is the reality. Plain and simple, water is not safe, no matter your ability or your age. With saying that, water doesn’t have to be feared, but it should be respected. Once they learn how to swim, toys, rafts, noodles and swim rings can be fun toys! Children should know exactly what happens if they go underwater, and they should know exactly what happens if they stay under for too long. They should know exactly how they need to move their arms to propel them to a safe part of the pool and they should know exactly how to kick their legs to get them there faster. For me, personally, a child with floaties on in the water is a one of the scariest things I’ve ever seen. My nephew was born in Magee, Mississippi in a little tiny town 45 minutes southeast of Jackson, in a house with an in ground pool. This little boy loved the water. He loved the water so much that we couldn’t keep him out of it. Even though he wasn’t big enough to open the door, if a door was left slightly ajar he would use all his strength to push it open wide enough that he could squeeze through and make a break for it. First item of business: jump straight into the water. Had this tiny little one year not been taught water safety he wouldn’t be alive today with his own brand new baby daughter that will probably love the water just as much as he does. In all aspects of life, children need boundaries. 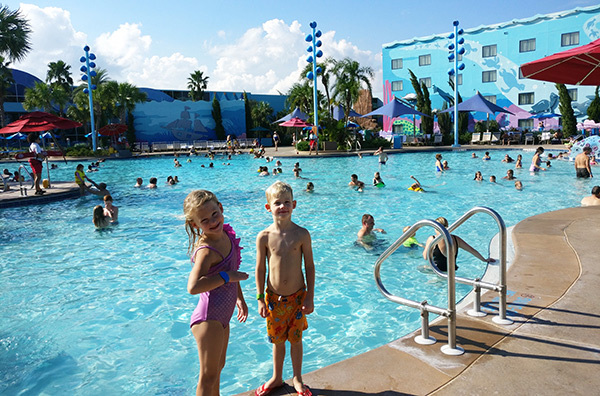 Arm floaties in the pool teach children that water is part of a lazy game that they can play at all by themselves. With floaties they don’t learn the crucial skill of how to maneuver from their front to their back. They don’t learn the essential skill of floating. They don’t learn the imperative technique of breath control. They plain don’t learn how to swim. can’t look away, you can’t take a break on the side of the pool, you can’t sunbathe while they splash around in the shallow end, but if you put in the time you’ll teach your child one of the most valuable skills they will learn in life. In the end, it’s really not that hard. Children know how to swim. They simply need exposure, loving guidance, and freedom to explore. By Catherine -, thanks a lot for the post.Really thank you! Much obliged. Thank you! We hope you found it useful!